Venezuela's Chávez Seeks Permission To Return To Cuba For Treatment : The Two-Way The request has renewed concerns about the Venezuelan president's health. Venezuelan President Hugo Chavez speaking during a TV program in Havana on March 4. 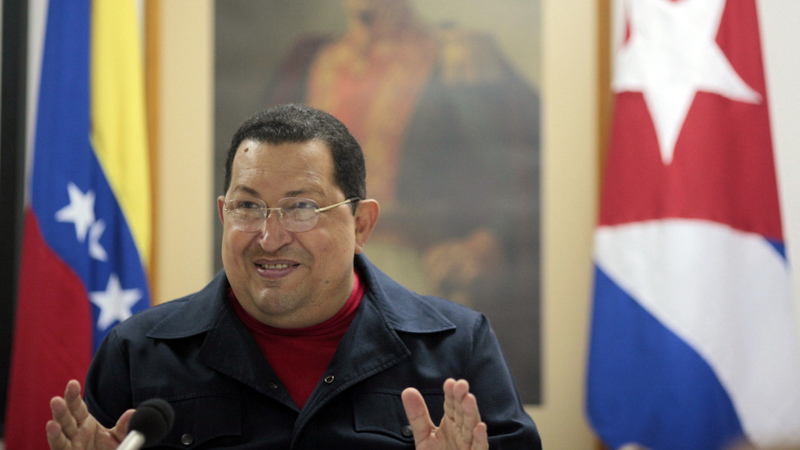 Venezuelan President Hugo Chávez may be once again headed to Cuba for cancer treatment. The country's National Assembly said it is set to vote today on whether to grant the president permission to leave the country for more than five days. Bloomberg reports there is very little detail about the Chávez's health, but since he announced that he had a recurrence of cancer in February, he has been in Cuba more than he has in Venezuela. As we've noted before, this is especially important because Chávez is facing reelection in October. "His absences have sparked a rally in Venezuelan bonds on speculation his illness will lead to a change in government and policies that have stoked inflation and driven away investment. "Chavez has refused to say what kind of cancer he has, where it's located or give his prognosis, fueling speculation that the disease is worse than he's letting on." El Expreso reports that in the past the National Assembly has voted unanimously to grant Chávez leave and the president has left the country hours after receiving the OK. The paper notes that since he arrived in Caracas earlier in April, he has made no public appearances. He did call into state TV to "celebrate the second anniversary of his presence on Twitter." El Expreso notes that Twitter is the basically the only way Chávez has communicated with the country.